button on the steering wheel, you can choose from the commands on the Main Menu. The following pages describe these commands and the commands in each sub-menu. Use the steering wheel switches to choose a command from the list. To browse the menu options, push the tuning switch on the steering wheel left or right. The system will always speak the current menu option. previous menu, press the button. 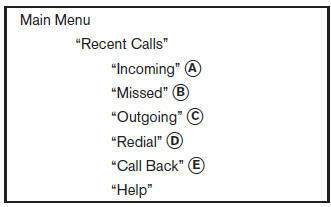 For additional information, refer to “Phonebook” in this section. When prompted by the system, say the number you wish to call. 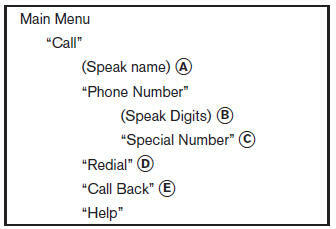 For additional information, refer to “Making a call by entering a phone number” in this section. If a redial number does not exist, the system announces, “There is no number to redial” and ends the NISSAN Voice Recognition System session. If a call back number does not exist, the system announces, “There is no number to call back” and ends the NISSAN Voice Recognition System session. “Cancel/Quit” — The system announces “Cancel,” ends the Voice Recognition session and returns to the call. “Send” — Use the Send command to enter numbers, “*” or “#” during a call. For example, if you were directed to dial an extension by an automated system: Say: “Send one two three four.” The system acknowledges the command and sends the tones associated with the numbers. The system then ends the Voice Recognition session and returns to the call. Say “star” for “*”, Say “pound” for “#”. The system announces, “Transfer call. Call transferred to privacy mode.” The system then ends the Voice Recognition session. NOTE: If a call is ended or the cellular phone network connection is lost while the Mute feature is on, the Mute feature will be reset to “off” for the next call so the other party can hear your voice. NOTE: The “Transfer Entry” command is not available when the vehicle is moving. NOTE: Each phone has its own separate phonebook. steering wheel. The system ends the session. To transfer a phone number stored in the cellular phone’s memory: Select “Transfer entry.” The system acknowledges the command and asks you to initiate the transfer from the phone handset. The new contact phone number will be transferred from the cellular phone via the Bluetooth® communication link. The transfer procedure varies according to each cellular phone. Refer to the cellular phone Owner’s Manual for details. 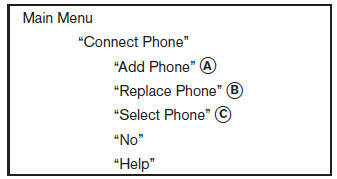 When a phone is connected to the system, the phonebook is automatically downloaded to the vehicle. This feature allows you to access your phonebook from the Bluetooth® system and call contacts by name. You can record a custom voice tag for contact names that the system has difficulty recognizing. Use the Recent Calls command to access outgoing, incoming or missed calls or dial numbers for the last incoming or outgoing calls. NOTE: The Add Phone command is not available when the vehicle is moving. Use the Add Phone command to add a phone to the vehicle. For additional information, refer to “Connecting procedure” in this section.